An older term referring to grafts that were dissected from plug grafts and later from donor strips. While a plug could contain as many as 15 hair follicles, micrografts and minigrafts typically contained no more than 5 or so. This allowed for a greater number of grafts that could then be distributed more evenly over a bald area of scalp. While the number of hairs obviously remained the same they could be spread over a larger area of bald scalp making the end result much more natural looking. This was a significant advancement in hair transplant surgery at the time because the “clumpy” look of the plug procedure could be massively reduced. Micrograft = 1 hair follicle per graft. Minigraft = 2-5 hair follicles per graft. Generally, micrografts were used to build and fill in hairlines, and minigrafts were used to fill and thicken the bald and thin areas behind the hairline. Micrografts and Minigrafts can be thought of as a first level of refinement. They were created by first taking large areas of hair bearing skin from the donor area as either a plug, a strip, or (later) an FUE. They were then transferred to a dissection table and divided down to smaller pieces of specific size. The doctors or technicians who did this often wore magnifiers which increased accuracy, efficiency, and speed of the dissection. When the grafts were cut down to the size of about a grain of rice and contained 2-4 hairs it was termed a Minigraft. When the grafts were cut down to less than a grain of rice size and only contained a single hair it was termed a Micrograft. What dictated the actual size of the graft was the size of the hole made in the recipient area by the doctor. So if the hole in the recipient area was 1.5mm long, then the length of the minigraft would be cut to about 1.5mm to insure a snug fit. 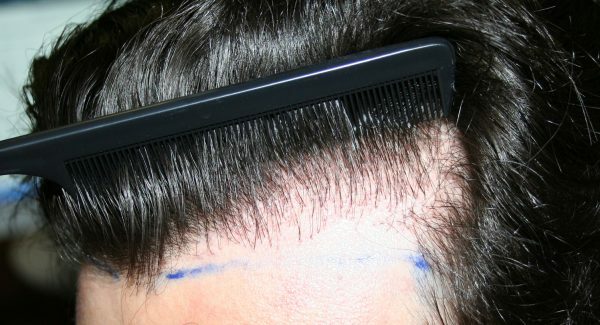 This technique along with Strip harvesting was the combination that sparked an explosion in hair transplant surgery. As the results began to look more natural, the demand for this procedure worldwide became insatiable. No more plug look. No more dolls head. While micrografts and minigrafts were a significant improvement over plugs, they still often fell far short of natural looking. Ultimately, Mini and Micrografts gave way to the more modern and refined “Follicular Unit”. The evolution to Micrografts and Minigrafts from raw plug grafts was a logical progression. In the early 1980s some pioneer doctors started to take Plug grafts and cut them into smaller pieces. These “Plug sections” had no special name but this level of refinement allowed for a wider distribution of hair which yielded more natural results. These “sections” were basically cut to fit the size of the hole being made by the doctor in the recipient area. But doctors could not make a lot of “plug sections” because the number of plugs that could be taken in total during a single sitting was limited. So let’s say a doctor removed 50 plugs from the back of the head. He could dissect each into four pieces thus creating about 200 “plug sections”. To do this required more skill, staff, facility size, time, and dedication. Placing 200 smaller pieces of tissue demanded a lot more than simply placing 50. The number of grafts may have been multiplied by 4 but the workload and skill level needed was multiplied by much more. Some doctors took up the challenge and a sort of race began. A race to see just how small those Plug sections could be divided down to and who could create and implant the greatest number of grafts in a single session was on. Reducing the size of the grafts and increasing the number of grafts produced during a single surgery became the holy grail quest for motivated and ambitious hair transplant doctors. The first problem was the limited number of plugs, and thus hair, that could be removed during any Plug procedure. Large plug procedures produced horrific scarring in the donor area and several other problems as mentioned in the Plug page of this website. But the solution finally came in the late 1980s. Instead of taking the grafts out as plugs which required leaving large gaps of untouched skin in between, a long strip was removed from the back of the scalp and every follicle could be dissected directly from it on a dissection table. While this procedure required far more skill and staff than simply removing grafts as plugs it nevertheless allowed for thousands of grafts to be removed in a single visit ! That was 10 to 20 times more than the Plug Procedure ever could. And there was the bonus that there was far less scarring and tissue damage to the donor area. So the Strip solved the first problem of limited grafts. The second problem was the challenge of dissecting the grafts into smaller sizes without damaging the follicles within. Until the late 1980s the Plug grafts were simply cut blindly into quarters and then placed into large holes made in the recipient area. A better way had to be devised to allow for more refined dissection. Pioneers realized that if they started to use magnifiers and microscopes that the grafts could be refined down to very small pieces with minimal damage to follicles. This was because the blade could be slid BETWEEN the follicles instead of blindly through them. Until then, cross cutting grafts and killing some was considered acceptable wastage. But with magnification and patience this could be largely avoided. So the process of cutting grafts down to small rice sized pieces began. The doctor would determine how big they wanted the graft to be and then the technician would cut them to that size using magnifiers. One size for the Minigrafts and a smaller size for the one hair Micrografts. Unfortunately, this method was “like cutting the foot to fit the shoe” but it worked out far better than plugs and represented a giant leap forward in hair transplant technology.Clearly more had to be done, and it was at about this time something very good happened. After using magnifiers and microscopes to create micrografts and minigrafts for a few years doctors and technicians began to realize that hair follicles regularly organized themselves into discrete bundles throughout the scalp skin- and that the relatively large spaces between them were the perfect place to apply a dissection blade to separate them out from the raw donor tissue. These follicular families became known as “follicular units” with the unfortunate initials of (FU) and the name stuck. A follicular unit was better than a minigraft because it did not contain any excess tissue around it. Thus the hair to tissue ratio became as small as it could be. This also meant that rather than making holes or big cuts to fit the grafts into the recipient area, much smaller slits could now be made in the skin. This, in turn, meant that more grafts could be packed together safely AND that the skin could heal faster and easier. So, Plugs gave way to “plug sections” which in turn gave way to Micrografts and Minigrafts which in turn gave way to Follicular Units. That’s where it stops. There is no way to refine grafts any further then this lowest denominator. Note to the wouldbe hair transplant patient. While just about every hair transplant doctor claims to dissect down to Follicular Units MOST DO NOT. Rather, they still perform Micrograft and Minigraft dissection as described above. That is, they are cutting the size of the graft to fit the recipient hole but they are not meticulously and patiently dividing the actual follicular units from the skin.